At POHP, LLC, our mission is to provide our clients with a professional image utilizing on-hold messaging to increase their profits. Our industry leading on-hold programs can truly set your company apart from the competition. From the moment a telephone conversation is initiated and placed On-Hold, your customers and potential customers are making value judgments about doing business with your company. POHP, LLC can help your company become more profitable by reducing caller hang-ups, answering frequently asked questions, and by educating callers about the nature of your business. Remember, perception is reality. Ask yourself what kind of image it is that you want your company to project? The image that your company has diligently strived for can be captured and projected in one of our professional on-hold programs. Here are some amazing telephone on-hold statistics: Executives spend 15 minutes a day On-Hold according to USA Today. That is 68 hours a year or eight and half business work days spent On-Hold over the average year! Maxi Market reports that 88% of callers placed on hold prefer on-hold messages to other hold options and 18-20% make a purchase based on an on-hold offer! A typical incoming phone call is placed on-hold for an industry average 42 seconds. To your company, that time can be very profitable. Why not use this time to educate callers about new products or services that your company provides...ones that the average caller might not know about? POHP, LLC incorporates state-of-the-art DIGITAL messaging equipment for optimal sound quality along with professionally written scripts and background musical arrangements that will tastefully represent your company's unique style and image to the world. At POHP, LLC, we'll partner with you to create a professional "mental imagery" tailored to your business. That means added sales and increased profits for you! 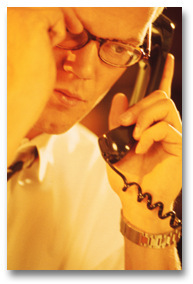 According to a recent telephony survey, approximately 70% of all business phone calls are placed On-Hold. 50% of those callers routinely wait on-hold for over one minute -- 60% of those callers Hang up-- and a whopping 34% of those who hang up will NEVER call back! At Profits On-Hold Productions, LLC, we also partner with your marketing department designing your on-hold program to be an extension of your company's overall marketing plan. You should keep your advertising consistent by utilizing your company's current broadcast advertising campaign, as well as your mission statement, slogan, and jingle, if you have one. Consistency is a major advantage that you can benefit from with an on-hold marketing program from Profits On-Hold Productions, LLC.